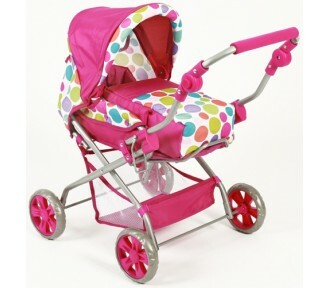 A wonderful range of doll prams as well as a jogger and stroller. All made by baby pram creator Chic 2000 Bayer to combine the benefits of baby prams into these doll prams so they're well made and designed, and great to play with. New for this season this jogging buggy with adjustable handle comes in summer bubble pattern made by..
New for this season is this combination pram has a removable carry case in Orange Plum made by estab..